New Delhi: While candidates in the Dangal 2019 are busy with campaigning, there is another lot of warriors working backstage: busy mining through election data and making assessments, devising strategies and analysing and re-analysing the trends. These are the political consultants and strategists who are toiling for 12-14 hours a day and sparing no effort to clinch a win for their clients. Aiding them is an army of hundreds of young men and women – researchers, digital marketers, analysts and software engineers. Winning a seat needs much more and here comes the role of specialists who have different tags attached to them – campaign managers, political analysts, political consultants/strategists and election managers. According to trade association ASSOCHAM, there were nearly 150 political consultants in India in 2014, which have now grown to 300 as claimed by industry insiders. The number is still growing. Promising their clients a swing of the voting public, they employ a whole lot of innovative and cutting edge techniques and custom-made tools to fulfil their promise and achieve victory for their clients. Do they use different strategies when it comes to Assembly and Lok Sabha polls? With the elections just weeks away, not only every day but every minute counts and the war rooms are full of hustle and bustle. 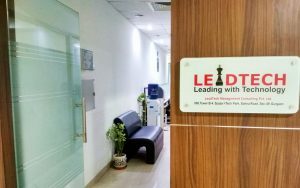 “Due to social media, a lot of fake news comes so verification has also become a big challenge in the war room. 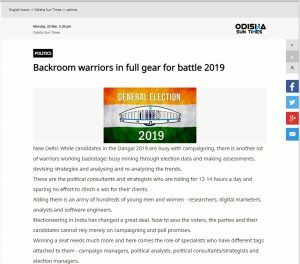 The war room is full of hustle and bustle for the party or leader who is in the winning edge whereas, for those on the back foot, there is a huge seriousness in their arena,” says Bagri. With scientific data handling analysis and cutting edge strategies, some campaign managers claim they can ensure at least 2-5 per cent vote swing. “The right approach in formulating the strategy makes a lot of difference. Campaign managers and political consultants can actually increase the vote share by up to 5 per cent by hitting the bull’s eye at the right time. Using pre-poll surveys at the grassroots level, if proper voter segmentation, analysis of the electorate and trends is done, then a leader winning with a thin margin can actually turn the tables in his favour in a major way,” claims Bagri.